There is no need to worry it from now. Because these Bluetooth trackers can help you track their locator finder no matter how far you go. A pin-drop will be marked automatically on map to show you where they are lost. Buy this one, you must not be disappointed. Order without Risk! 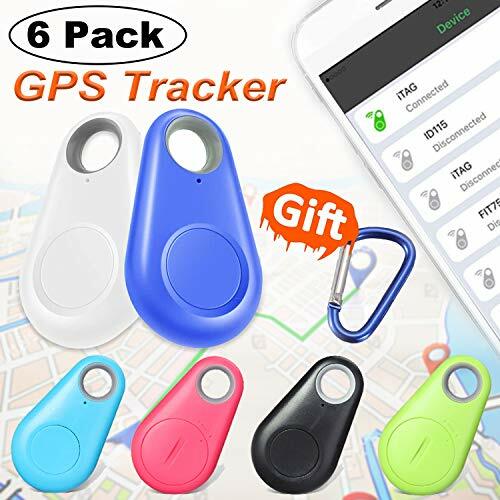 SUPER NEW 6 PACK SET TRACKER - You will get a super value set with 6 pcs bluetooth tracker and 6 pcs FREE carabiner. The tracker wil keep track of important things peace of your memory from losing keys, pets, car, wallets, bags,kids and so on. It is a Practical and Small Device easy to carry and use，which makes it the perfect fit for your key or wallet. ANTI-LOST & TRACKER FUNCTION - Anti-lost alarm can effectively protect your kids, pets or valuables from being lost or stolen within 49 Feet effective distance range, when out of this range your phone and this device will automatically ring for a timely warning. Just open the phone app and find on the map where you lost the things. LOOKING FOR YOUR ITEMS - The key finder work with Bluetooth 4.0 connection lets you sound an alarm whenever your phone and the tracker are separated ,Locates Where you last left them to the nearest Street and then give you signal strength Guiding you to your lost item!! You can even Locate Your Phone by pressing the button on the Gadget it will send the Phone a Ringing Noise until you locate your phone. BLUETOOTH REMOTE CONTROL - You can remote control the device camera or voice recording of your phone by press a button.It can take awesome wide angle selfies from your front or rear facing cameras. Works as a remote shutter for self-portrait, capture the happiest moment easily. OFFICIAL APP - "cTracing".You can download "cTracing"APP in the app store, then open it, open the phone Bluetooth and location, Mobile phone and anti-lost device will automatically link and prompt, Tracker will also alarm.The battery can last for about 6 Month.Uses one CR2032 coin battery（Replaceable）.If you have any questions, please feel free to contact us.